E.H ON BOOKS AND MORE: Discussion Point – What Is It About “That” Author That Rocks Your Boat!!! Discussion Point – What Is It About “That” Author That Rocks Your Boat!!! I am not sure how other bloggers come up with some cool topics to get a chatter going on their blog – but I rely a lot on my kids to do the dastardly deed for me. I don’t sit down with them and brainstorm or anything like that, but I am quite observant when it comes to the likes and the dislikes of my kids and being the age that they are – it is always a good reflection of either how I was or if I have actually change from that person at all. I thought an incident that happened a few months ago highlighted apart of me that I never thought about before but would be perfect for this weeks Discussion Point. This topic relates to my son and I going to the latest release of Derek Landy book – The Faceless One a few months ago. 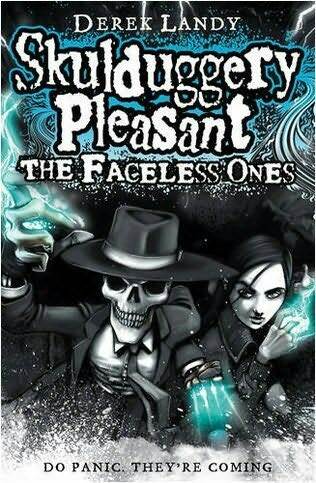 This book forms apart of the Skulduggery Pleasant series. From the moment the book blurb hit the internet my child went gaga…. Fast-forward almost ten months later and it’s release day and I am being hauled to HMV at 8.30am for a book that cost 22 Pounds – yup you heard me right 22 quid. We got there so early not even the boxes were unpacked as yet so we joined the little queue that was there. People, when my son got his hardback in his hand he literally hyperventilated – seriously, we had to sit down for a good half an hour for him to settle down. During this time he was clutching this book to his chest like manna from heaven. How could I not think my 22 quid was well spent after that. This brings me to today's Discussion Point question. What is about the author that you are most passionate about that have you coming back for more from them, following their every blog post – literally blackmailing people to read their books. Is it the Plot, style of writing, characters, consistency or willingness to take a chance and be edgy. I could say all of the above and more, but what makes my love for Diana Palmer different from a Andrew Grey that I love his work – but I am not stalking him like I stalk Ms Palmer. What is it about a LaVryle Spencer that makes me give all her books pride of place on my bookshelf despite the fact that she has stop writing now for almost 20years. *fan girl moment* I'm so with your son, EH, I LOVE the Skulduggery Pleasant series. Thinking about my fave authors - both Nora Roberts and Terry Pratchett immediately spring to mind - there's nothing that they really have in common apart from being very fine storytellers. Instead, the 'rocking of my boat' happens entirely at my end. I'm not sure I can put it into words. If anything it is that feeling that you get when a story just resonates with you. It hits a cord deep within you that when you finish it you know that you'll be keeping it and rereading it for the rest of your life. Does that make sense? I agree with the way you phase that - it is that feeling that you get after you read their books.. Characters, I'm a sucker for quirky characterization, where peeps on paper become lifelike and three dimensional. When they make me feel it all that they are going through I am going straight to my utter reader's bliss zone. My authors who currently float my boat are Joey W Hill, Lauren Dane, Kresley Cole and Nalini Singh. I don't care what pricetag their books have, one releaseday I'm having my copy. Okay, gotta run the vacuum before I can watch TV. I wonder if Karin Slaughter still runs her own vacuum? It's characterization, style, subject and execution that rocks me. If I can get lost in a book-so much that I forget to eat, what time it is-and the story resonates for weeks after I'm finished reading it, then that's a book I'll have to own. I intersperse a lot of YA in with adult novels. Lately, I'm more impressed by the YA. The author of The Hunger Games and Catching Fire had such a hold on me with both stories that I had to read them twice and they're still amazing. Her writing style is brief, concise. Every word carries it's weight. There is nothing in these books you have to wade through to get to the good stuff. Another YA series I love is L.A. Meyer's Bloody Jack Series. I read the first from the library but had to have the entire series in hard back. Every word propels the story forward without filler. I love the humor. As for adult books, I do love Karen Moning's Fever Series, a big (good) change from her highlander books. Raven Hart's books are great, too. These books keep me guessing and that's big with me. I marvel at a good author's ability to express an idea so perfectly with few words. It shows me they have command of the language. I think it's a combination of things - good characters and quality writing - being the most important. There also has to be another 'hook' as it were, whether it's one character that I can latch onto or a situation in a book which resonates with me. I also like humour, so any authors who utilise a dry sense of humour running through their novels has me wanting more. Sometimes it's not a particular author, but rather a series which has me all excited. I'm counting the days to the fifth AE book because I love those characters, but I'm not necessarily always desperate to read all the rest of Josh Lanyon's books (oh who am I kidding, I am pretty keen to read the new one out this week). "It's characterization, style, subject and execution that rocks me. If I can get lost in a book-so much that I forget to eat, what time it is-and the story resonates for weeks after I'm finished reading it, then that's a book I'll have to own"..
You love the books first and the the author... Cool way to think of it.. It's something about the author's voice..it is hard for me to pinpoint. I just picked up PsyCop and I knew from page ten I would love Vic. But I also humor - that is really important to me. It doesn't have to be LOL moments, but I need that degree of sarcasm or dry wit that always resonates with me. I agree - good characters and quality writing are a winner with me as well. Price is definately a hit with me.. I am reading a fantasy book now and the author just blows me away.. I know I am already hooked on her style.